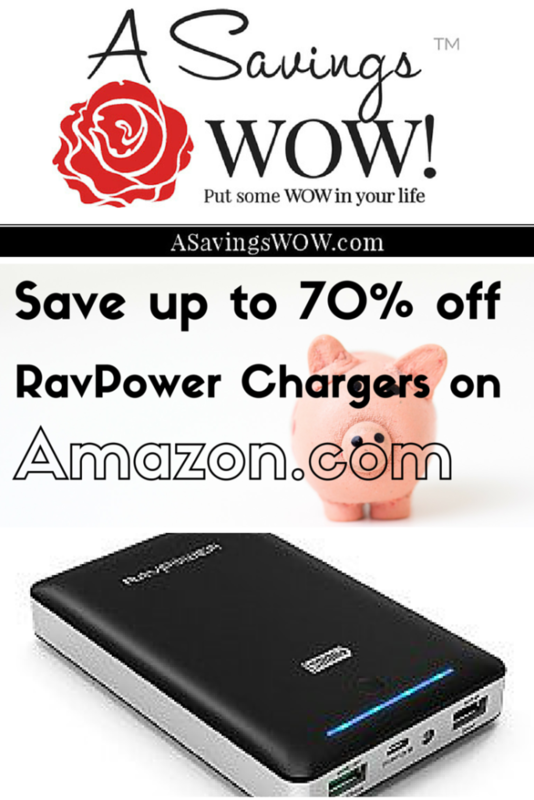 RavPower Chargers | A Savings WOW! When we went on a road trip to Florida last month, which took about 24 hours, we wanted to make sure we were equipped with a cell phone charger that was portable, easy-to-use, can charge multiple devices and fully charge the devices before needing to be recharged itself. We decided to purchase a couple of theRAVPower 13400mAh Portable Chargers on Amazon.com after reading the reviews and when they were at a good price. It was one of the best purchases we’ve ever made! We are able to charge our smartphones and tablets with it from 0% to fully charged without the charger being completely drained. It also seems to charge a lot quicker than other chargers. We decided to get two – one to keep in the car in case of emergencies and one to take with us around Walt Disney World. It made our trip less stressful since we also used our phones as our main device to take photos. We never worried about running out of battery. It’s on sale for 61% off on Amazon.com today with free 2-day shipping with Amazon Prime. It also makes great gifts! Other RavPower chargers are also on sale for up to 70%! Wished I would have seen this when it was on sale!